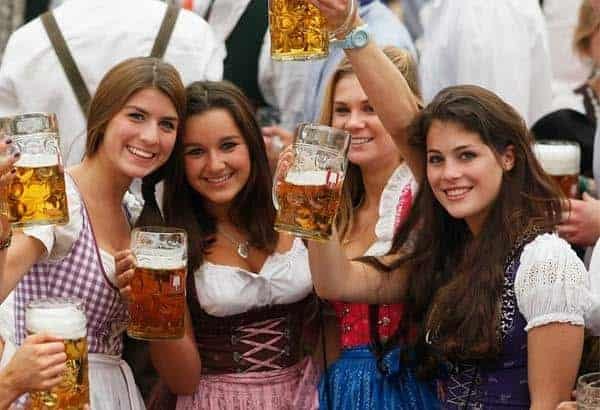 With just over a month to go until Oktoberfest 2012 starts in earnest and some very thirsty Aussies make the trek to Germany’s Munchen, VERONICA WHAANGA looks at what makes the Deutsch beer fest one of the greatest parties on earth. SOME are young, some are old and some are legless. The time of year is near again when hordes of travellers, beer swillers and beer spillers from the world over descend upon the people of Munich for the annual Oktoberfest. What began as a night out for the locals – on 12 October 1810 – has become an international lager frenzy set inside the Theresienwiese — an enormous exhibition ground with carnival rides, souvenirs, food stalls and huge beer halls. If dancing on seats and tables while singing along to a brass band and swigging litre steins of beer sounds like your idea of a good time then Oktoberfest is the place to be. It all started with the mother of engagement parties: Princess Therese von Sachsen-Hildburghausen’s betrothal to Bavarian Crown Prince Ludwig (later Ludwig I). Then attended by almost the entire Munich population, it was such a success it became an annual affair. Little has changed, although the event was moved to the end of September for the better weather and to make sure a lot more people show up for the party. Oktoberfest each year now attracts more than six million people who guzzle some seven million litres of beer over 16 days. 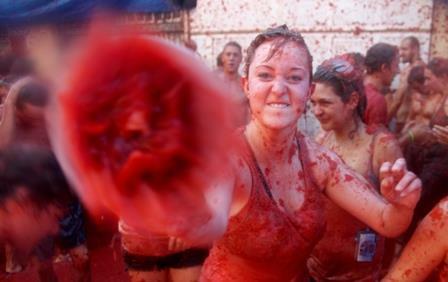 The festival always begins on the second last Saturday in September and ends on the first Sunday of October — this year 22 September to 7 October. Each year the festival kicks off at noon on the first day in the Schottenhamel Tent where the lord mayor of Munich cracks open, or ‘taps’ the first barrel with a cry of “O’zapft is!” (“It is tapped!”). There is no entrance fee to the festival grounds or beer halls, but it is a good idea to arrive early in the day to get a table inside a beer hall or, if the weather is good, outside in the beer gardens. You can only be served if you have a seat (whether sitting or standing on it). Arriving early has obvious repercussions when one litre steins are in hand, so it is advisable to take turns with your table mates to man the table or seats while the others look around the festival grounds. Asides from thrilling rides and shoddy Bierfest souvenirs you can also buy your own (empty) steins, and a giant pretzel or bratwurst to line your stomach. The bratwursts are highly recommended for something approaching an authentic German experience — over 850,000 are sold during the festival. 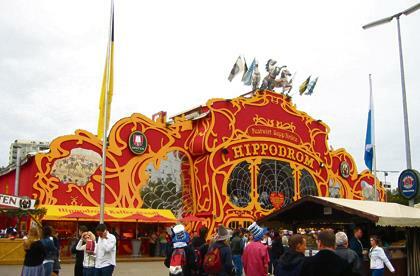 The beer tents, set up by a number of different Munich breweries, heave and pulsate with dancers on seats chanting along with the big brass bands as they belt out Bavarian folk songs and classics from the likes of Bon Jovi. There are now 14 beer tents on die ‘Wiesen (‘the meadow’), each seating around 10,000 punters at any one time and each with its own unique crowd, food specialities, and characteristics. The HofbrÃ¤u-Festhalle is considered the rowdiest, and happens to have the most tourists (and Antipodeans), particularly during the first week. The Hippodrom is said to be for the local VIPs, but seems to have more local and travelling singles than the other halls. Most tents close at 11:30pm with last drinks at 10:30, but one or two stay open until 2am for those hard drinking souls. The legendary serving wenches carry up to ten steins at a time in their ample arms, and when you consider that each stein is thick glass with one litre of the amber liquid you understand why their wrists are so heavily bandaged. 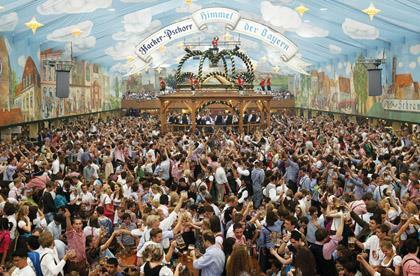 The prices for one litre of beer will range from 9,10 â‚¬ to 9,50 â‚¬ during Oktoberfest in 2012.